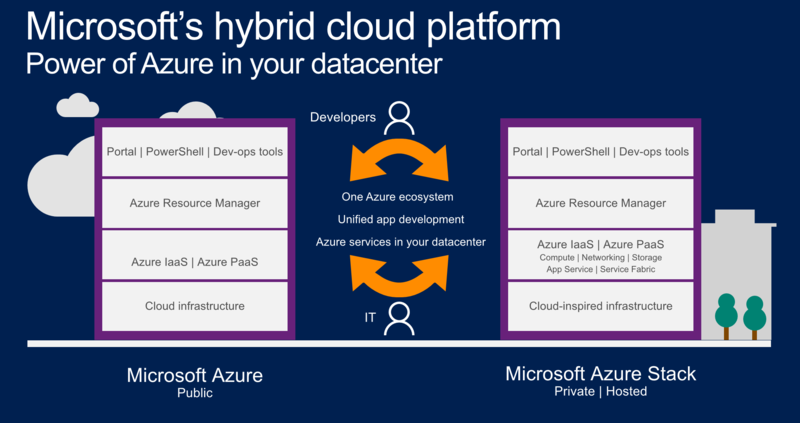 Microsoft Azure Stack is a hybrid cloud solution that allows organizations to run Azure consistent services in their data center, providing a simplified development, management and security experience that is consistent with Azure public cloud services. Azure Stack is an extension of Azure; it enables you to run Azure services from your on-premises environments and then move to the Azure cloud if and when required. Azure Stack allows you to deploy and operate both infrastructure-as-a-service (IaaS) and platform-as-a-service (PaaS) services using the same tools and offering the same experience as the Azure public cloud. Management of Azure Stack whether through the web UI portal or through PowerShell has a consistent look and feel for IT administrators and end-users with Azure. The screen shot below of provisioning and managing a virtual machine in Azure Stack looks identical to Azure. Jeffrey Snover, Microsoft Technical Fellow & Chief Architect for the Azure Infrastructure and Management Team, describes Azure Stack as one of the most radical products Microsoft has ever released. He describes it as the first product in a completely new category: Hybrid Cloud Platform. It has been designed to accelerate an organization’s digital transformation on their terms where the Cloud is a model and not a location. It allows an organization to focus on its core activities for business growth instead of context activities such as on-prem IT infrastructure management. With Azure Stack, businesses can meet their most challenging IT requirements including data sovereignty, security, and compliance requirements. They can also run high-performance analytics and edge and disconnected applications, as well as provide a platform for modern application development. • Azure Stack enables you to run the same service across multiple countries—as you would using a public cloud—but meet data sovereignty requirements by deploying the same application in data centers located in each country, thereby ensuring personal data is kept within that country’s borders. • Applications that demand extremely high levels of performance and data ingress and egress may not benefit from a public cloud solution. • For example, using the public cloud to analyze large sets of data located in your data center requires that you first upload the data. But that may take a long time and not return the results as quickly as you need for internal business processes or competitive timelines. • Azure data egress charges may minimize the cost benefits of using a public cloud when compared to Azure Stack. • You may need to run applications either on the edge or ones that disconnect from your data center for a period of time. Some examples include ships, submarines, deep mine operations or remote locations without consistent or reliable connectivity. • Cloud-native applications are developed to run as microservices in many different environments. Developers don’t want to have to use a different set of development tools for different microservices just because they run in a different environment. The fastest and most efficient option is to develop applications using a consistent set of tools and then deploy the application to wherever it’s required. Azure Stack and Azure are API-compatible, eliminating that concern. On-premises IT infrastructure provides a secure and controlled environment for business solutions but it also requires configuration, deployment, backup, and management tasks. IT administrators spend most of their time on these tasks, to simply keep their on-prem environments running. 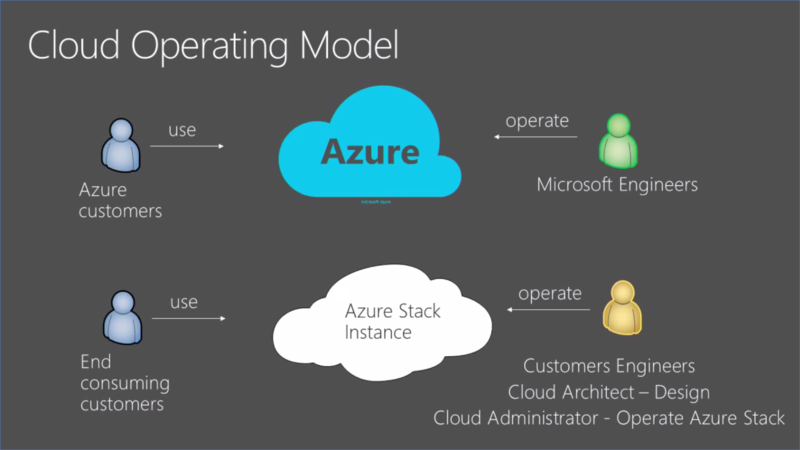 Operating Azure Stack is different than using the services of a public cloud such as Azure and requires a business to think through operational requirements to have a successful Azure Stack deployment and ongoing management. • Ensuring that your IT infrastructure capacity is configured to correctly deal with the demands of providing cloud capacity. • Simple and effective tools for monitoring, security, business continuity, and disaster recovery. • IT infrastructure is successful only when your users are satisfied with the services provided, and you can successfully provide and operate these services for your users consistently.